Chevrolet has revealed the all-new 2018 Traverse in the wee hours leading up to the kick-off of the 2017 North American International Auto Show, boasting a redesigned SUV that the brand anticipates will provide best-in-class third-row legroom, maximum cargo room, and passenger volume in addition to its snazzy new look. 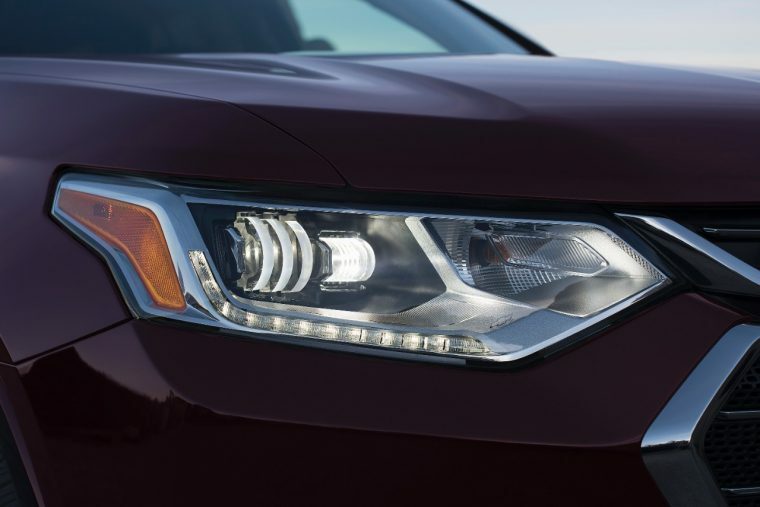 The 2018 Traverse will carry on the design nomenclature of Chevrolet’s newest SUVs, and it will be offered with aesthetic touches including chrome accents, LED signature lighting, and available D-Optic LED headlamps. New for the next-generation will be two new trims: a Traverse RS for the sport-minded customer and the High Country for lovers of luxury. The former will feature a blacked-out look through black badges, chrome grille, wheels, and various other exterior touches. The latter will receive exclusive Loft Brown leather interior appointments and suede accents, 20-inch polished wheels, standard D-Optic lighting, twin-clutch Advanced AWD, power-third row seating, and unique badging. 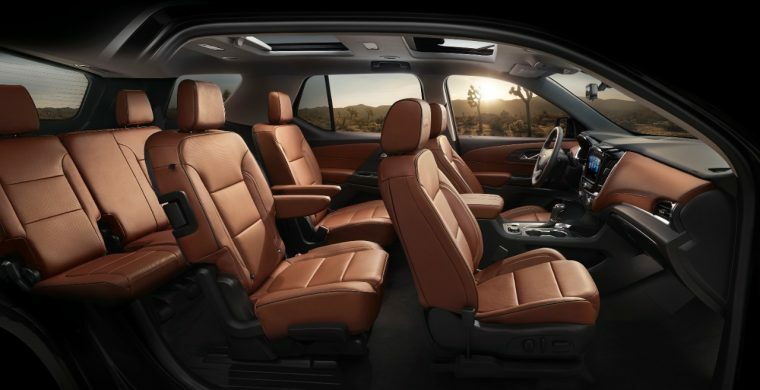 Irrespective of trim, Chevrolet anticipates that the 2018 Traverse’s 98.5 cubic feet of max cargo room and 33.7 inches of third-row legroom will provide best-in-class utility and comfort. Additional convenience features include an available bowtie puddle lamp to help illuminate where a foot should be placed to activate the hands-free power liftgate; a split-folding second row; and safety features including Lane Keep Assist with Lane Departure Warning, Teen Driver, Rear Seat Reminder, Surround Vision, and Low- and High-Speed Forward Automatic Braking. 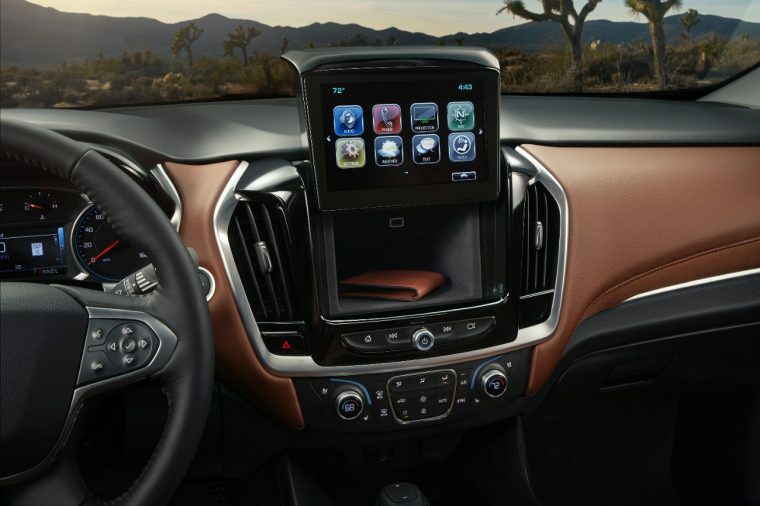 Of particular interest is a feature that will allow the driver to slide the Traverse’s touchscreen upward for convenient behind-the-center-stack storage. How fancy! 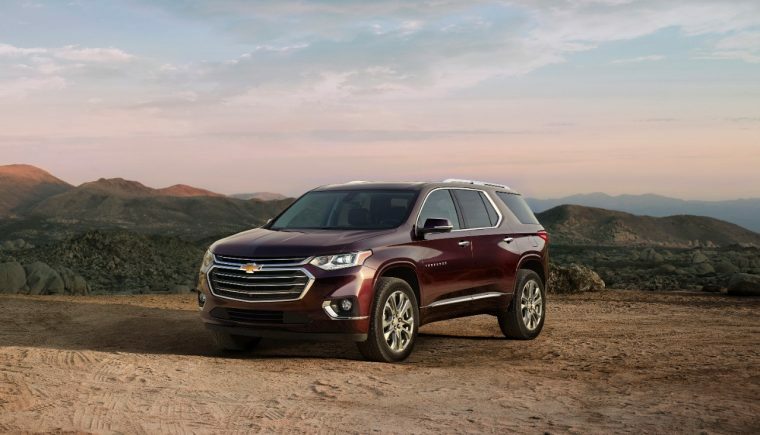 The 2018 Traverse will be powered at base level by a new 3.6-liter V6 engine mated to Chevy’s all-new nine-speed automatic transmission, a combination that is expected to offer more power and better fuel economy than the outgoing pair. The Traverse RS will be offered with the same 2.0-liter turbo that will feature in the 2018 GMC Terrain and 2018 Chevrolet Equinox. All models will feature standard intelligent stop/start technology and Traction Select Mode. The 2018 Traverse is set to hit dealerships this fall, where it will become the fourth new crossover of SUV to hit GM’s lineup—preceded by the 2017 Trax, Bolt EV, and 2018 Equinox.